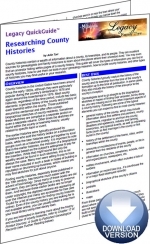 The Researching County Histories Legacy QuickGuide™ contains useful information to provide you with an introduction to county histories and some tools and tips to help you with your research. With a little know-how and encouragement, you will be well on your way to exploring the various compiled histories available and furthering the research of your ancestors. This handy 4-page PDF guide can be used on your computer or mobile device for anytime access.